Brewed exclusively for export. 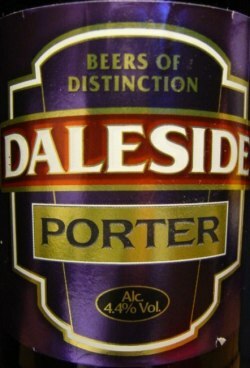 Daleside Porter is distinctively dark in colour, full of body with a smooth velvet finish. Cask conditioned at The Bell, Banbury. Black with cream head. Full chocolate malty beer with reasonable bitterness, roasted malt background, some sweetish caramel then fruitiness. A little mixed up perhaps but still nicely drinkable through the pint. Bottle from Tbone, thanks! Deep dark brown color. Fresh coffee and caramel in the aroma. Medium bodied. Freshly milled coffee, molasses and a hint of chocolate in the flavor. Just a hint of malty sweetness. Pleasant porter. Bottle. Dark brown colour with a tan head. Roasted aroma with some sweetness. The flavour is roasted malt, chocolate and sweet. Slightly bitter finish and quite thin body. Deep reddish colour with a tan head. Malty, fruity flavor with a light tobacco note. Light dry finish with ashtray notes.